By bobblybear, December 31, 2018 in Book Blogs - Discuss your reading! Welcome to my 2019 book list!! Hopefully it will be kept more up to date than my 2018 list (which I started halfway through the year, and only ran to 2 pages ). My format is going to stay the same as previous years. For some reason, I've always categorised books by the year they were purchased....which means I am really cringing when I see how many books I purchased 5+ years ago but have yet to read. My aim is to reduce my TBR pile, but unfortunately it just seems to be growing year on year. Oh well, there are worse problems to have so I'm not too bothered by it. I haven't listed my treebooks (I didn't list them in 2018 either), mostly because I had a massive cull in early 2018 and I just don't have the energy to go through my bookcase and list them all. I will hopefully read some of them this year, but I expect most of my reading with be done on my Kindle. Anyway, enough rambling from me. I hope everyone has a great reading year in 2019 and I look forward to reading everyone's posts in the coming year. I've finished my first audiobook of the year - Killers of the Flower Moon. I can't remember why I bought it - if it just caught my eye, or it had very favourable reviews - as I didn't know anything about it before I started listening. In the 1920s, the Osage Indians (who were among the richest group of people in the world) were being murdered one by one. These people had been relocated to Oklahoma, on what later turned out to be some of the most fruitful oil fields in the country. They were given the full land rights over this oil (but unbelievably were all required by law to have guardians to manage their wealth) much to the resentment of a lot of the 'white' population around them. After some very half-hearted local investigation into these murders the case was eventually turned over to the newly formed Bureau of Investigation (soon to be called the FBI). The book is told in three main sections. The first part is from the perspective of Mollie Burkhart, who was one of the Osage Indians and who's family members were among the first to be murdered. The second section is told from the perspective of Tom White, the federal agent who was assigned to the case. The final section is the author's view on the case, after carrying out his research nearly a century after the crimes were committed. It was an absolutely fascinating case, with so many twists and turns that you'd think it was fiction! And when the culprits were identified....well it was pretty shocking! The audiobook was only about 9 hours long, but it covered so much information. Because it was told from different perspectives and different timelines, you got to hear how these crimes affected everyone involved and in some cases were still affecting them several generations later. Is it okay to post in here? Yes, ok to post. Happy reading year to you too. I don't often purchase physical books anymore, but picked up these gems today. The Almanac is such a pretty book isn't it? I was looking at it in Waterstones recently and was very tempted, there are just so many great books out this year! Yeah, I loved the look of The Almanac. I could have bought it on Kindle (as it was the Daily Deal a couple of days ago) but it's the kind of book that is definitely worth getting a physical copy of. 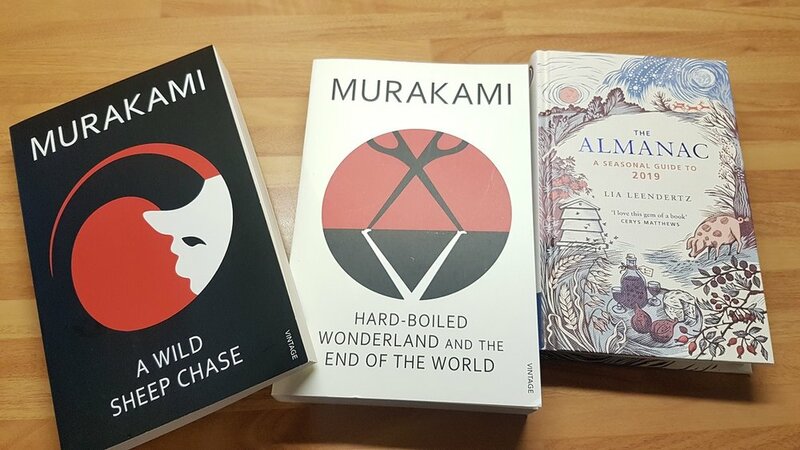 Hard Boiled Wonderland and the End of the World does sound a bit strange but then again, all of Murakami's books are pretty 'out there'. Such pretty books! I hope you like all three of them . Thank you. It's not often that I buy physical books but I couldn't resist. And they are fairly light so will be easy to read in bed.